Kentucky, USA-headquartered crane manufacturer Link-Belt Cranes has released details of a new 120 ton (110 metic ton) rough terrain crane: the 120|RT. The crane will be unveiled on Link-Belt’s stand (F903/3) at the forthcoming Bauma trade show in Munich, Germany, in April. 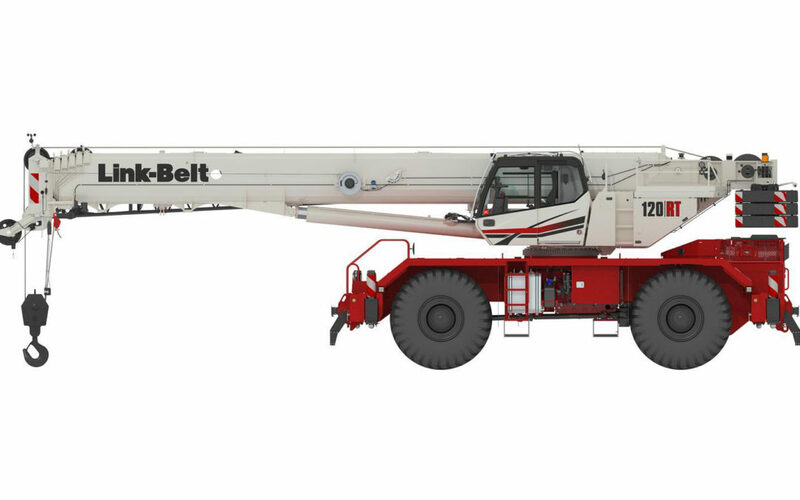 According to KHL, Link-Belt said the new crane has a six-section 11.6 – 50 meter (38.3 – 164.1 ft.) pin and latch formed boom. A two-piece 10.7 – 17.7 m (35 – 58 ft.) on-board offsettable fly with manual offsets at 0, 15, 30 and 45 degrees is also available. The fly boom has been designed to be erected by one person, with the aim of minimizing work at height, with ground controls for fly assist and boom hoist cylinders, Link-Belt. Two 4.9 m (16 ft.) lattice insert extensions provide a maximum tip height of 79.8 m (261.7 ft.). The six-speed transmission is powered by a Stage V/Tier IV compliant Cummins QSB 6.7L 232 hp (173 kW) diesel engine. A Tier III Cummins QSB 6.7L 240 hp (179 kW) diesel engine is also available. The crane’s tires measure 29.5×25. The axles are mounted to the carrier via a greaseless four-link suspension system. Routine service is aided by centralized electrical locations, remotely mounted filters, and easy-access fluid check said Link-Belt. The 24-volt electrical system uses Controller Area Network (CAN bus) wiring. This, Link-Belt said, enables multiplexing between the crane’s five modules, which control key functions such as outrigger beams and winches. This means that in the event of a module being out of use (for servicing, for example), other modules compensate and enable the crane to keep on working. Access to the carrier deck is facilitated via new ladders. Link-Belt says that regardless of slew angle the operator has easy exist to the flat deck from the cab. The 120|RT has textured paint and slip-resistant paint on the carrier deck. The crane uses Link-Belt’s V-CALC (Variable Confined Area Lifting Capacities) system. This has 81 different outrigger configurations with real-time 360-degree charts. Once outriggers are set, Link-Belt explained, its Pulse 2.0 control system indicates the crane’s available capacity. The system then previews the operator’s real time capacities given the crane’s current configuration at the next five radiuses for a set boom angle. When selected, the Pulse 2.0 can provide a live view of the working area with colour-coded quadrants. If the chart exceeds capacity at a given slew angle, swing arrest will initiate five degrees prior – allowing the crane to come to a smooth stop, Link-Belt explained. Information is displayed via a 25.4 cm (10 ”) touchscreen display. The Link-Belt Pulse 2.0 system is customisable and can be updated and serviced remotely. 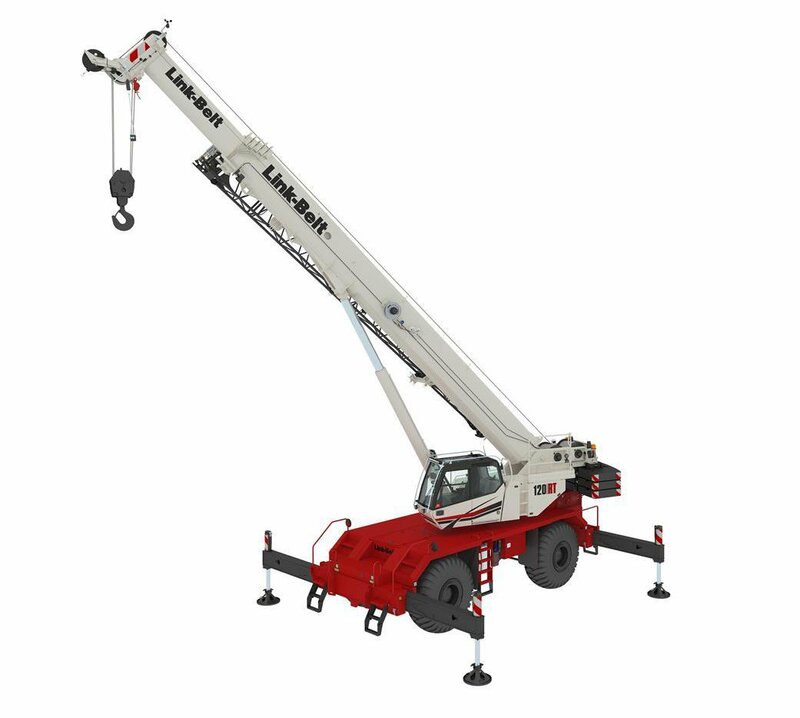 The crane’s upper frame is built from high strength steel and houses a new winch design. Link-Belt said the new winch has ‘ultra-wide’ drums for increased line pull at higher working layers. The maximum winch line pull is 105.1 kN (23,632 lb.). The system uses hydraulic outboard routings and the wiring harnesses has been designed to be easier to service, explained Link-Belt. The standard counterweight comprises three removable slabs weighing a total of 13.2 tonnes. The crane has the same cab that was launched in 2017 on Link-Belt’s 75|RT, meaning it can tilt 20 degrees. Lighting-wise, Link-Belt said it has fitted the crane with Dual amber strobe lights, LED working lights and outrigger lights. A camera vision package is available to enhance on-board site monitoring. It includes a back-up camera, as well as cameras for viewing winches and the right side of the upper. With a fully-equipped base unit, minus modular counterweights, the crane weighs 42 852 kg (94,472 lbs.). It has a height of 3.91 meters (12 ft 10 ”).